A pub on the ground floor of an office block, run by Barworks. 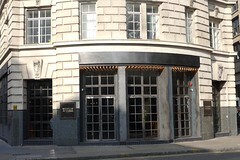 It's located at the bottom of City Road, by Finsbury Square, between Old Street and Moorgate Tube stations, and was formerly a sports bar. This is a large, spacious single room pub, with bare floors, glazed tiles on the walls, a U-shaped metal bar with barstools to the rear photo, and large tables alongside the windows on both sides of the room photo. The space in front of the entry doors is kept clear of tables, perhaps anticipating a crush of people on busy weekday work nights. On a mid-afternoon Wednesday visit in March 2015, the space was fairly empty, with a wide choice of tables available, although music was playing at a not insignificant volume. Service was very friendly. The bar has four hand-pulls for a constantly changing selection of real ale (on our March 2015 visit, there was something by Burning Sky, Siren, Gipsy Hill and one other). There are also around 20 keg taps, with the full range of Camden Town core beers (from £4-£4.50/pint as of March 2015, though the half we ordered was charged at £3), one for Mortimer's Orchard cider, one for Lagunitas IPA, and 12 taps for guest keg beers. An extensive menu (available on the website) lists these as well as a good range of bottled beer photo of beer menu. In addition, there are wines and spirits covered. A pint of lime and soda was £1.60 in March 2015. There's also a decent looking food menu, which we did not sample on our visit photo of food menu. Breakfast is served 8am-5pm and mains from noon-10pm. There's a separate cocktail bar area called 5CC downstairs (also quite large in size, though without beer taps), open in the evenings. Ewan's verdict: It's hard to judge how successful a pub is on the basis of a single mid-afternoon visit, and given its location it would not be surprising if it got particularly busy on weekday nights. Barworks pubs tend towards being loud, raucous environments at such times (great for those looking for such a place), and Singer Tavern looks to be no exception. However, visiting at an off-peak time on a sunny day, this is a pleasant environment to stop for a drink, and the drinks range is excellent. Accessibility: A fairly large step to get in. Toilets are located in the basement, though there's a RADAR-locked door on the ground floor towards the rear which may lead to an accessible toilet (it is unsigned, so may be best to check with bar before visiting). Last visited by Ewan and Kake, March 2015. Opening hours taken from the Singer Tavern website, March 2015. Food times taken from the menu, March 2015. Last edited 2015-03-30 16:51:14 (version 2; diff). List all versions. Page last edited 2015-03-30 16:51:14 (version 2).